People in their 50s and older who have yet to retire and are in need of jobs like any other working citizen. These older job seekers are just as capable and valuable as their younger counterparts but tend to get overlooked because of their age. Depending on the industry, though, they may have twice the experience of their colleagues and even employers. 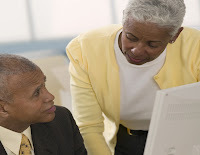 Many companies tend not higher individuals in this demographic are due to their biases: high compensation needs, lack of computer skills, inflexible management style, difficulty reporting to a younger superior. But think about the people who work in Congress and that some of our youngest presidents were just over 40. Clearly, people 50 and up aren't only more than capable of being assets in the workforce but our own government is run by them. Granted, those working in Washington tend to have a leverage of power than other positions, they still demonstrate the influence of what older age can have on society. -Discuss in your interviews how you changed your management approach to better fit the challenges in different business cultures. -You'll have an edge over younger candidates if you're more willing to accept less salary up front in return for a greater performance-based bonus. -Provide examples of when you helped younger bosses succeed, grow, and advance their careers. Point out how you plan to manage what your boss wants to achieve now so that he or she will have more time to work on what needs to be done in the future. -By the time you reach age 50, you will have developed skills and expertise in things like people management, problem solving and leadership. Companies highly value these skills and also offer major advantages over less experienced younger executives. You're most likely to solve problems faster so try to emphasize examples where you quickly identified key factors impacting performance and developed solutions that timely improved results. -Revise your search strategy. Larger companies and smaller ones hire in different ways so your approach should be tailored to each. Larger ones usually have built-in succession plans and hire of their people internally, whereas small companies usually hire exectutive talent from outside as their company grows. Something to think about: there are 20 times as many companies nationwide with sales under $100 million as there are above. So focus some of your energy here where they are less concerned with your age and more so with experience and decision-making abilities.